My grandparents are coming up on their 60th wedding Anniversary in a few months’ time and I have been thinking about making them some “his and hers” diamond themed scarves as a gift (since we can’t afford to give them actual diamonds)! I came across this diamond infinity scarf, and I think it could work well for both men and women. I haven’t tried this exact one yet as there are a few birthdays and Christmas gifts to be getting on with first. One of the birthdays coming up is my dad’s. 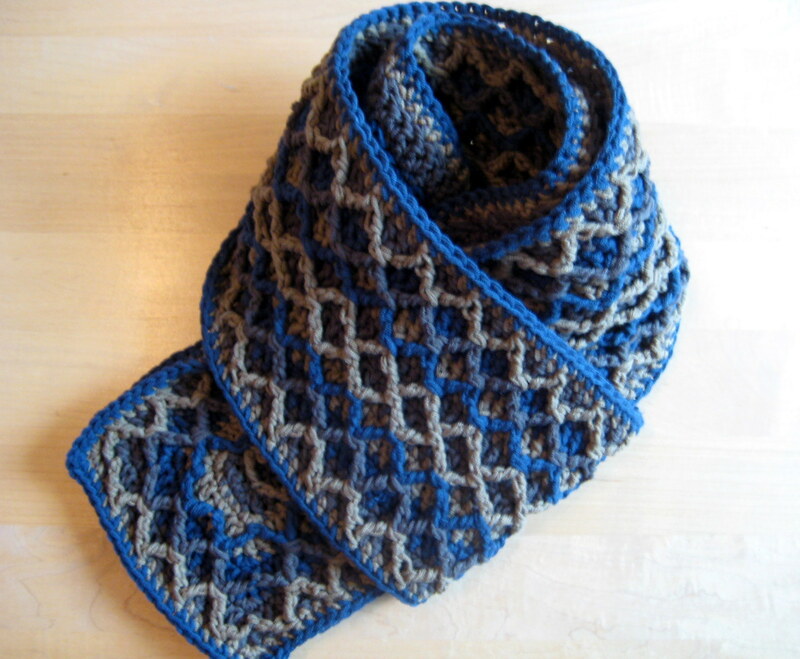 I had been planning on making a regular scarf for him, and so I have made a modified version of the diamond pattern scarf as I wanted to try out the special fptrc2tog stitch. 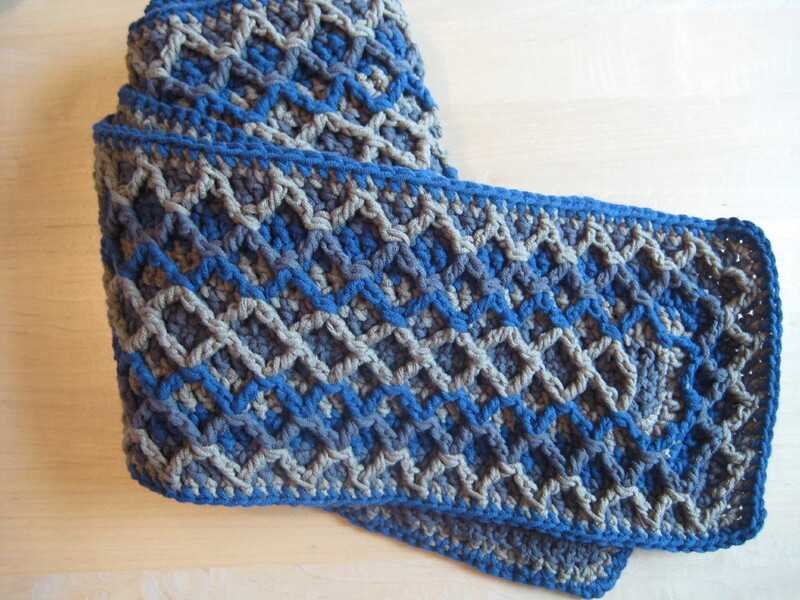 I used 3 colours (grey, blue, and mustard) of rowan all seasons cotton yarn and a size 6mm hook. The pattern is worked in rounds about an initial starting row to keep it symmetrical and to keep down the number of ends which need weaving in (you could modify it to work backwards and forwards in rows if you prefer). 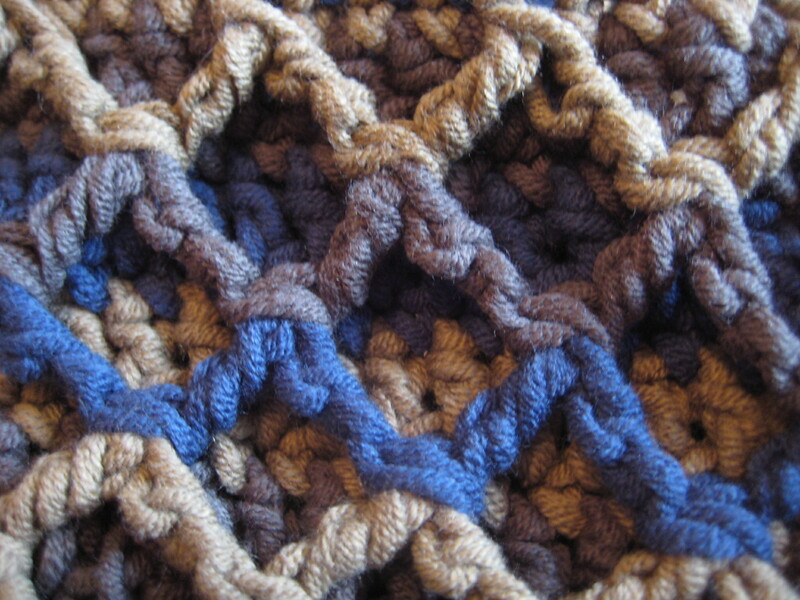 Special stitch: Front post treble crochet 2 together (fptrc2tog). This makes a V-shaped stitch in front of the work with the two arms of the V being worked around the posts of sc stitches 2 rows below. All the V’s worked side by side make the zigzag pattern. Yarn over hook twice, insert hook horizontally (from front to back to front again) behind the “post” of the 2nd sc in the initial start row, yarn over hook and draw up a loop (4 loops on hook). *Yarn over hook, draw through 2 loops, repeat from *, 2 loops left on hook (one arm of the V made). The remaining fptrc2tog stitches of round 2 are worked the same but with the first arm of the V worked around the same post as the last arm of the previous stitch. After round 2 the fptrc2tog stitch is worked around the top of the previous fptr2tog stitches rather than the sc posts (except at corner locations). Starting with your first colour (grey in my case), chain 187 (or any multiple of 4 +3 stitches). Initial row: sc in 2nd chain from hook, sc to end, ch2 (counts as 1 dc) and turn. Now work back along the single crochet stitches, but at the end rotate the piece to continue working into the same chain as the initial row, thus working in rounds from now onwards. Round 1: 1dc into each st to last st, work 2sc into the side of the dc just made, sc into the sc in the intitial row, (2sc, 1dc) into 1st ch, dc in each ch to end, work 5sc across the dc just made and end sts, join with a sl st and fasten off. Round 2: Join the 2nd colour (in my case this was mustard) into a corner st (to work along the long edge). 2sc, *fptrc2tog, 3sc, repeat from * to first corner, 3sc in corner st, 5sc, 3sc in 2nd corner, 2sc, *fptrc2tog, 3sc, repeat from * to 3rd corner, 3sc in corner st, 5sc, 3 sc in final corner, join with a sl-st into starting sc. Round 3: ch2 (counts as 1 dc), 1 dc in each st around but work 3 dc into each of the 4 corner sts. Join with a sl-st and fasten off. Round 4: Join the 3rd colour (in my case this was blue) into any st directly above an fptrc2tog st along a long edge. 2sc, *fptrc2tog, 3sc, repeat from * until the 1st corner, work the last arm of the last fptrc2tog into the post of the 2nd dc in the corner st (this will make an extra zigzag arm to the previous round). 2sc. #3sc in corner st, 2sc, fptrc2tog (working the first arm into the same location as the last arm of the previous fptrc2tog and the last arm into the central sc of round 2), 3sc, fptrc2tog (mirror the previous st for the arm locations), 2sc, 3sc into 2nd corner st, 2sc. Continue to work in (fptrc2tog, 3sc) pattern until the 3rd corner and repeat from #. Continue in pattern until the round is complete, joining with a sl-st. Round 6: Repeat round 4 (with first colour). At the short edges add in an extra fptrc2tog st to keep pattern. Round 8-9: Repeat rounds 6-7 (with 2nd colour). Round 10: Joint colour 3 and sc around entire piece putting 3 sc into each corner st. Fasten off and weave in all ends. 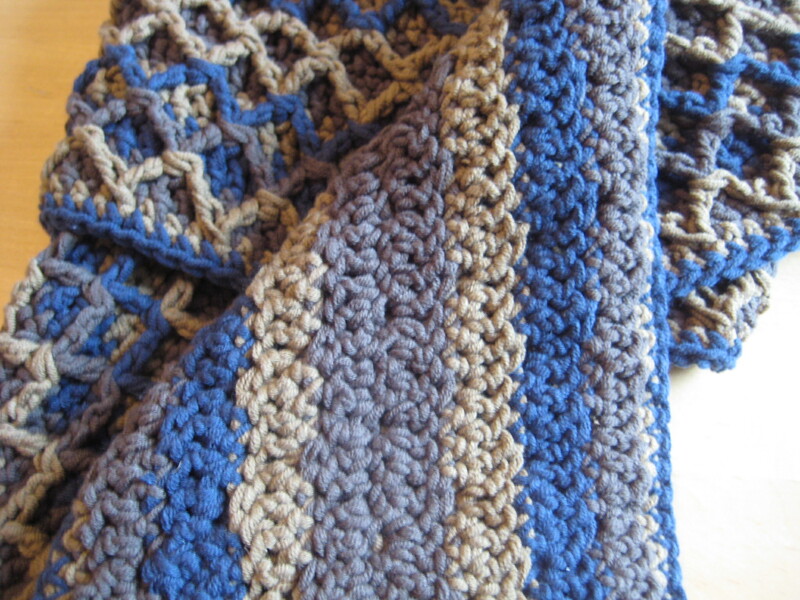 Love the zigzags! It looks great – different. Thanks for the pattern. I’m sure dad will love it. Yes yes! I love my new scarf, blue and brown. I’ll wear it with a hat, I’ll wear it with Matt! And all thanks to Esther – I’ll wear it in winter. I’ll wear it to impress, and when shopping – nonetheless! I’ll wrap it around. Wear it up – wear it down! I do so love my scarf blue and brown! Thanks Esther – Love Dad. When it comes time to rotate at the end of the second row of scs, how many scs should I do into the side to get to the bottom of the chain? Two, three? In round 1, should that be 1 dc in every st until the last st? And when working the 2 scs into the last dc just made, does that mean making the scs into the post of the dc? Honestly that doesn’t quite make sense to me since that sounds like it’s 2 scs into the second last st and I would have thought perhaps it should be 2 scs into the last st to form a corner? Also in round 2, does “2sc into 1st ch, 1dc into 1st ch” mean into all the one st? Or ch? Hi Nisha-Anne; sorry you are having some problems, let’s try and sort it out! The pattern starts with a foundation chain plus a row of sc (you could use a start row of fsc’s instead if you prefer). Then you swap to working in rounds starting with a round of dc sts. To get around the ends use 5 sc sts total, I have altered the wording in my pattern above – I agree it was confusing, sorry! Q1 & 3: Use 2sc around the post of the dc you just made to turn a corner- if you prefer to work it all into the last sc st you can but I found this was more even. Then 1 more in the side of the sc in the row below, then 2 more sc’s in the chain below that – a total of 5 sc’s. Q4:I think you meant round 1? If so, yes I meant all into the one starting chain st (now working in rounds you should now be about to work along the initial chain stitches). I have now altered my notation to clarify. Thank you soooooo much for the reply and yes, it did help enormously. I went the easy way and did the scs into the last stitch, making sure I ended up with five on each corner as set out in the pattern. And yay, got the nice long even strip and am now tackling the lovely three dimensional posts! I want to make a head band with this stitch but i’m so intimidated by it, can you please give me some reassurance?